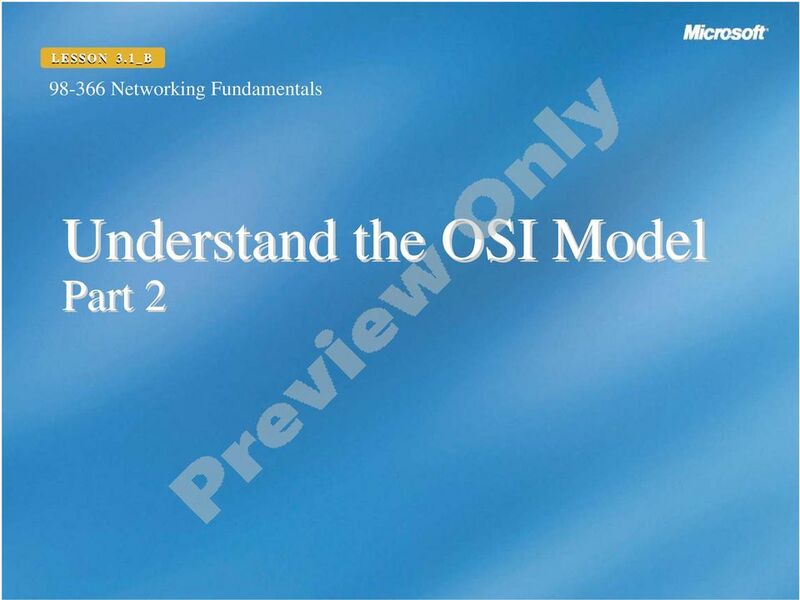 Download "Understand the OSI Model"
4 The Internet Protocol Suite Includes Transmission Control Protocol (TCP) and Internet Protocol (IP) and is referred to as TCP/IP model. 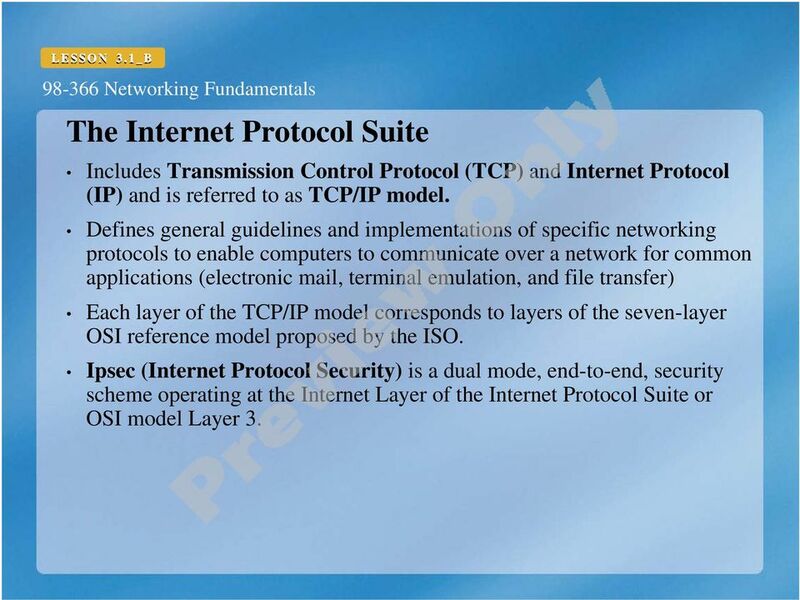 Defines general guidelines and implementations of specific networking protocols to enable computers to communicate over a network for common applications (electronic mail, terminal emulation, and file transfer) Each layer of the TCP/IP model corresponds to layers of the seven-layer OSI reference model proposed by the ISO. Ipsec (Internet Protocol Security) is a dual mode, end-to-end, security scheme operating at the Internet Layer of the Internet Protocol Suite or OSI model Layer 3. 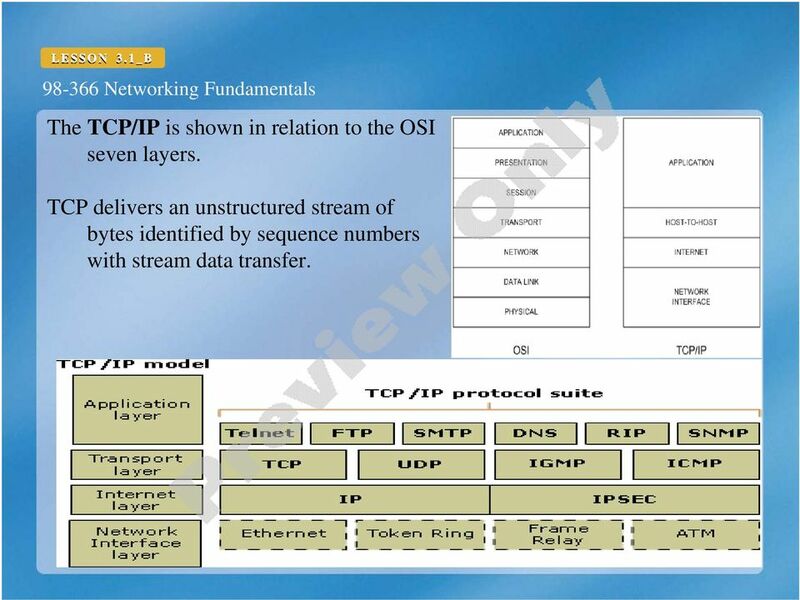 5 The TCP/IP is shown in relation to the OSI seven layers. TCP delivers an unstructured stream of bytes identified by sequence numbers with stream data transfer. 6 TCP/IP Provides end-to-end connectivity specifying how data should be formatted, addressed, transmitted, routed, and received Protocols exist for a variety of communication services between computers. The layers near the top are closer to user application, the layers near the bottom are closer to the physical transmission of the data. Viewing layers as providing or consuming a service is a method of abstraction to isolate upper layer protocols. The lower layers avoid having to know the details of each and every application and its protocol. 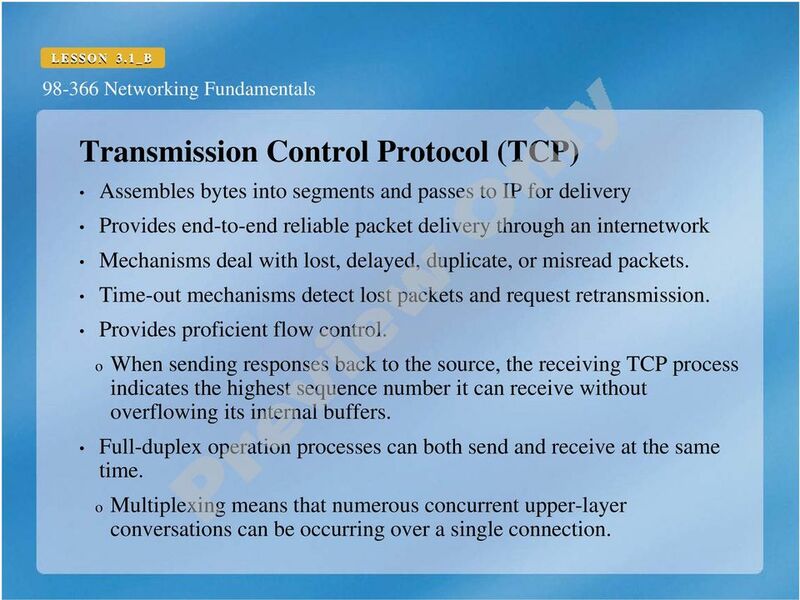 7 Transmission Control Protocol (TCP) Assembles bytes into segments and passes to IP for delivery Provides end-to-end reliable packet delivery through an internetwork Mechanisms deal with lost, delayed, duplicate, or misread packets. Time-out mechanisms detect lost packets and request retransmission. Provides proficient flow control. o When sending responses back to the source, the receiving TCP process indicates the highest sequence number it can receive without overflowing its internal buffers. Full-duplex operation processes can both send and receive at the same time. o Multiplexing means that numerous concurrent upper-layer conversations can be occurring over a single connection. 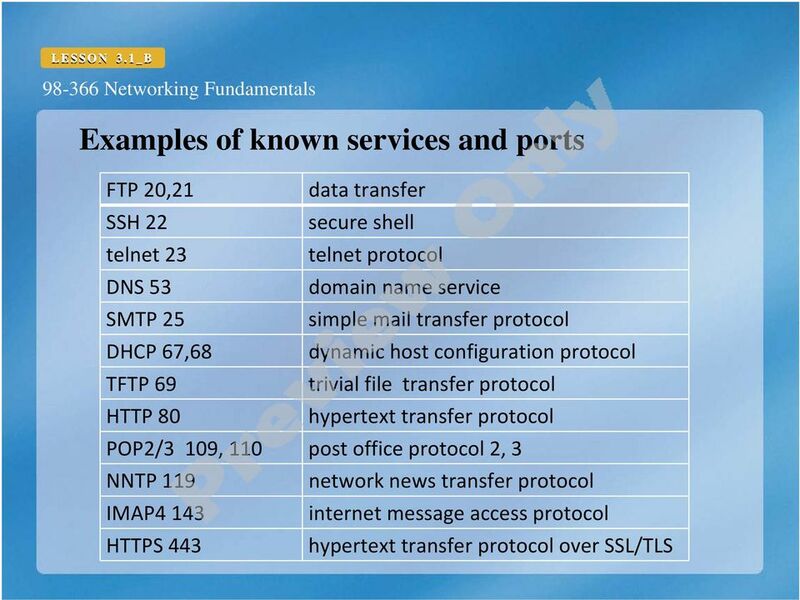 10 Well-Known Ports Most services work with TCP/IP by configuring the server to use a well-known port number. The client connects from a random high port. Most of these well-known ports are port numbers below 1,024. 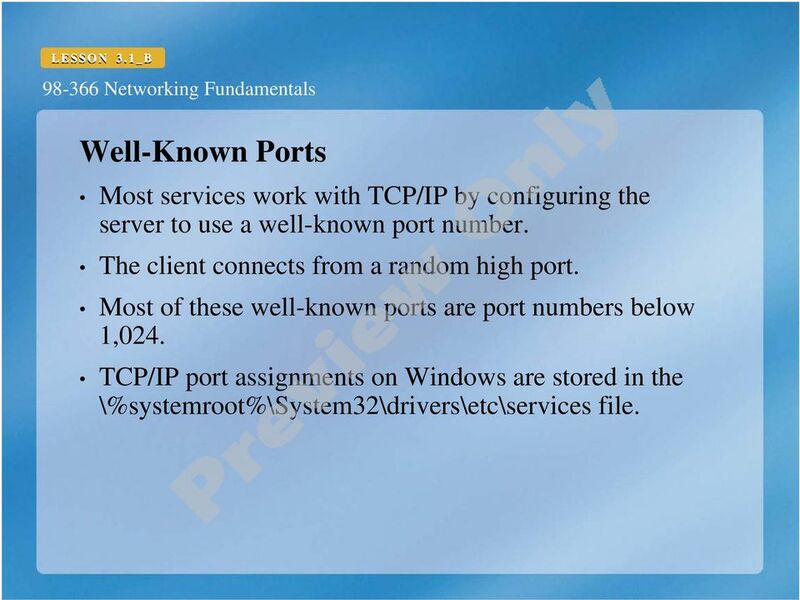 TCP/IP port assignments on Windows are stored in the \%systemroot%\system32\drivers\etc\services file. 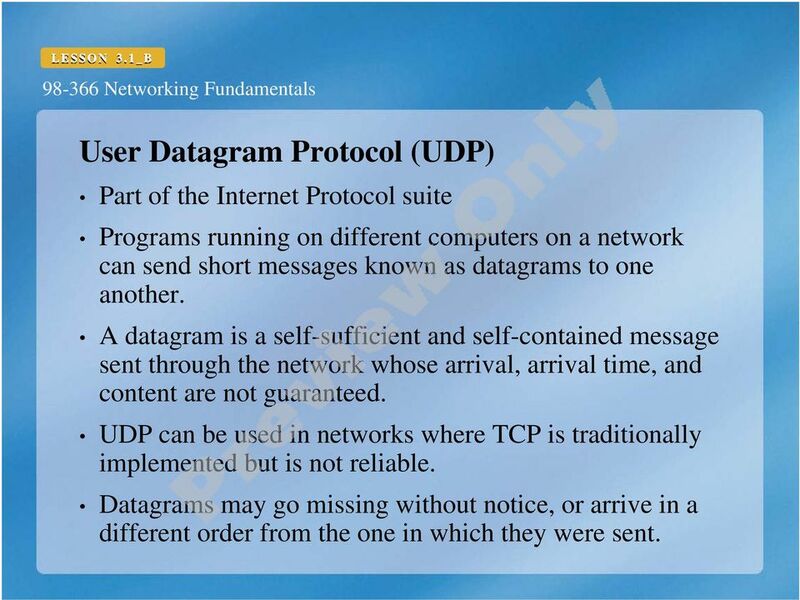 12 User Datagram Protocol (UDP) Part of the Internet Protocol suite Programs running on different computers on a network can send short messages known as datagrams to one another. A datagram is a self-sufficient and self-contained message sent through the network whose arrival, arrival time, and content are not guaranteed. 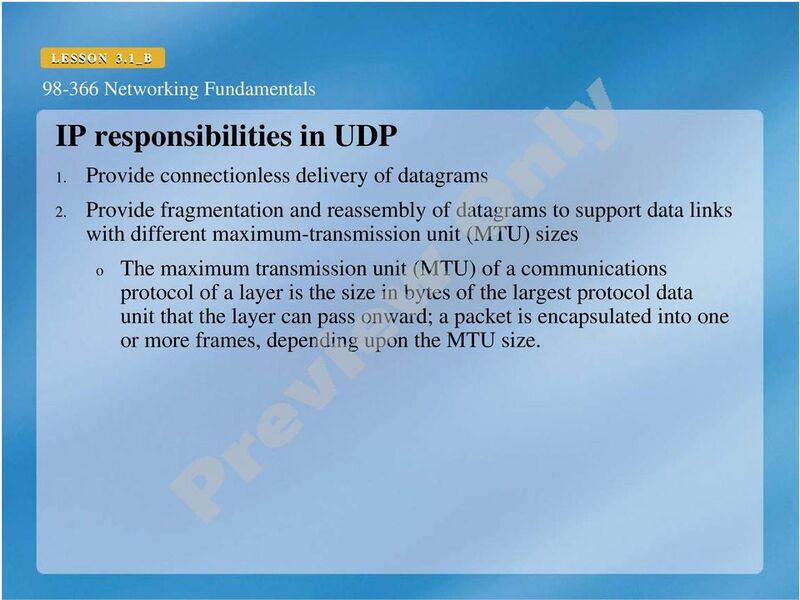 UDP can be used in networks where TCP is traditionally implemented but is not reliable. Datagrams may go missing without notice, or arrive in a different order from the one in which they were sent. 13 IP responsibilities in UDP 1. Provide connectionless delivery of datagrams 2. Provide fragmentation and reassembly of datagrams to support data links with different maximum-transmission unit (MTU) sizes o The maximum transmission unit (MTU) of a communications protocol of a layer is the size in bytes of the largest protocol data unit that the layer can pass onward; a packet is encapsulated into one or more frames, depending upon the MTU size. 14 IP Packets All IP packets are structured the same way an IP header followed by a variable-length data field. 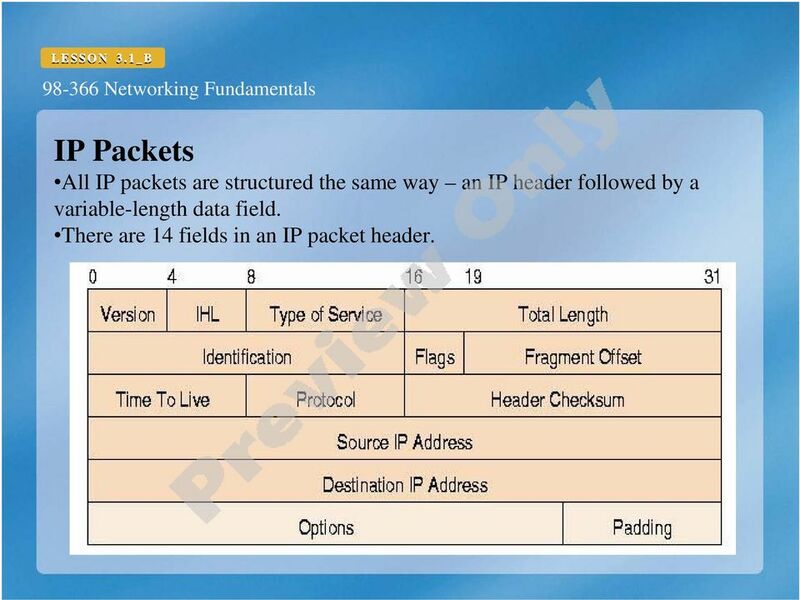 There are 14 fields in an IP packet header. 15 A packet and a frame are both packages of data moving through a network. 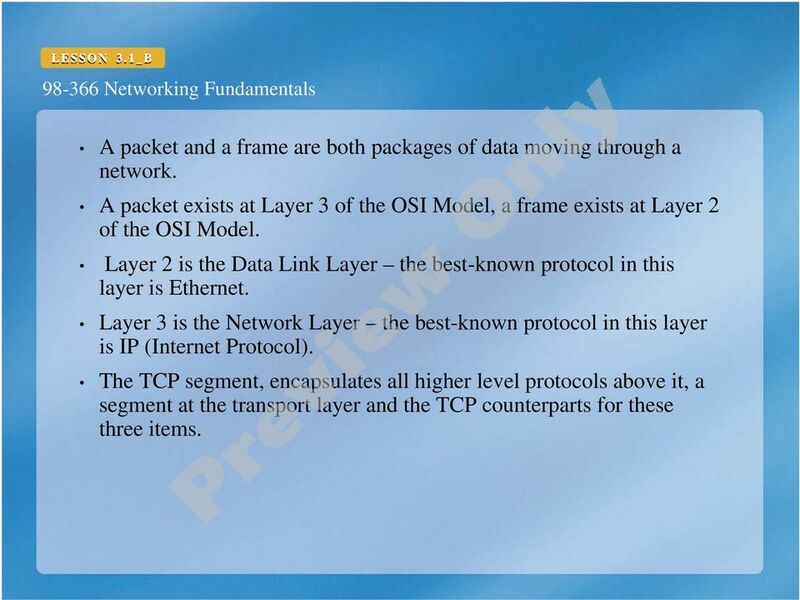 A packet exists at Layer 3 of the OSI Model, a frame exists at Layer 2 of the OSI Model. 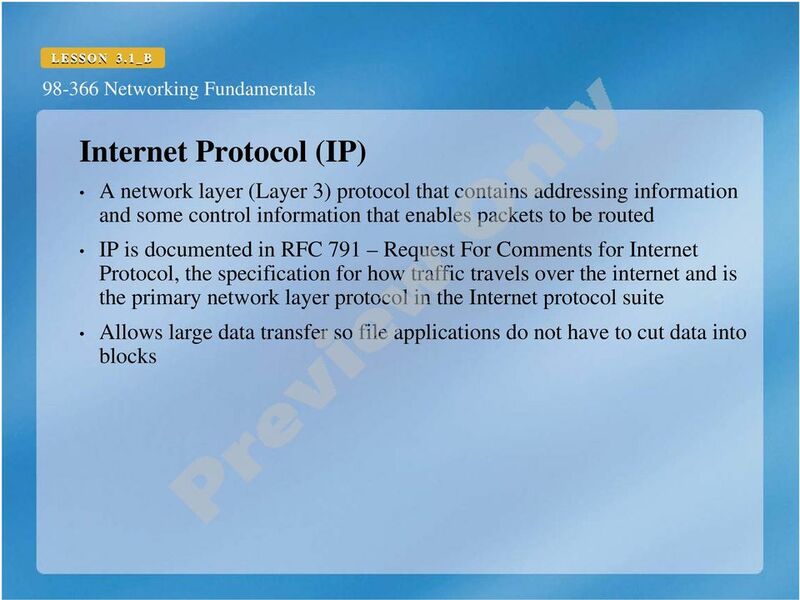 Layer 2 is the Data Link Layer the best-known protocol in this layer is Ethernet. 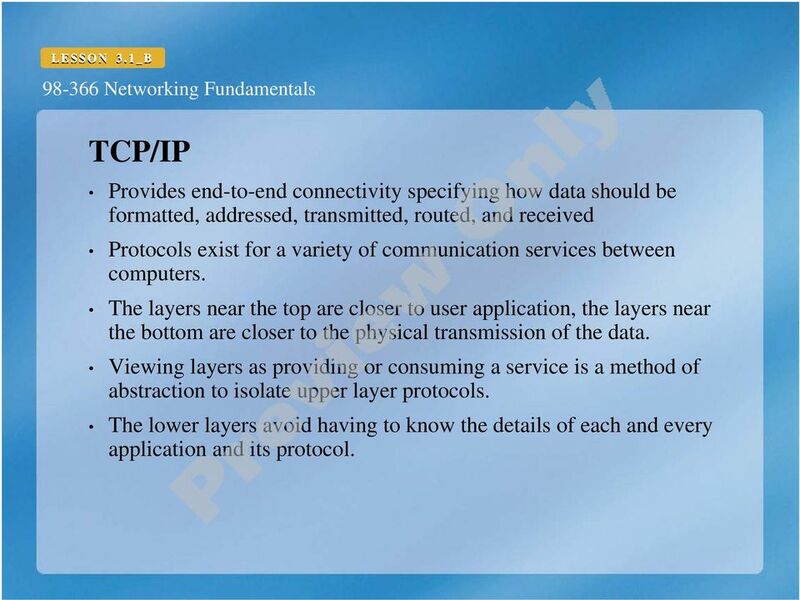 Layer 3 is the Network Layer the best-known protocol in this layer is IP (Internet Protocol). 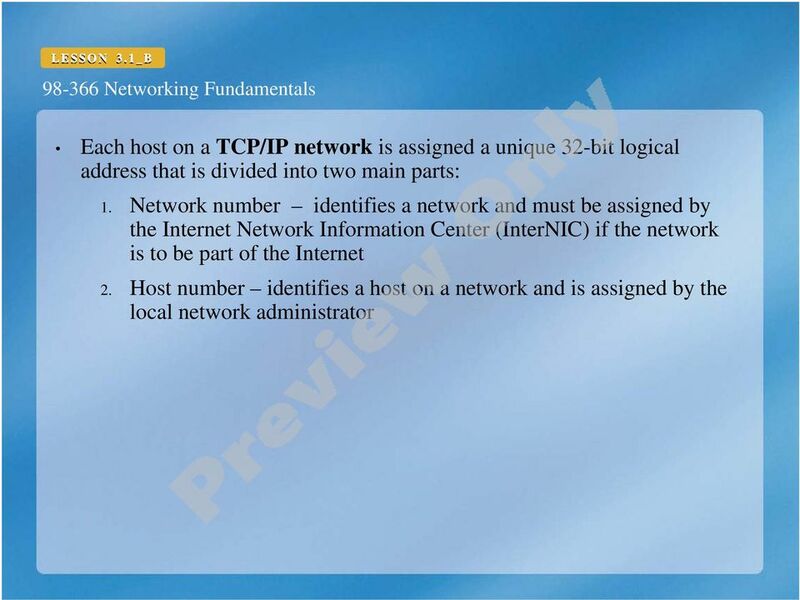 The TCP segment, encapsulates all higher level protocols above it, a segment at the transport layer and the TCP counterparts for these three items. 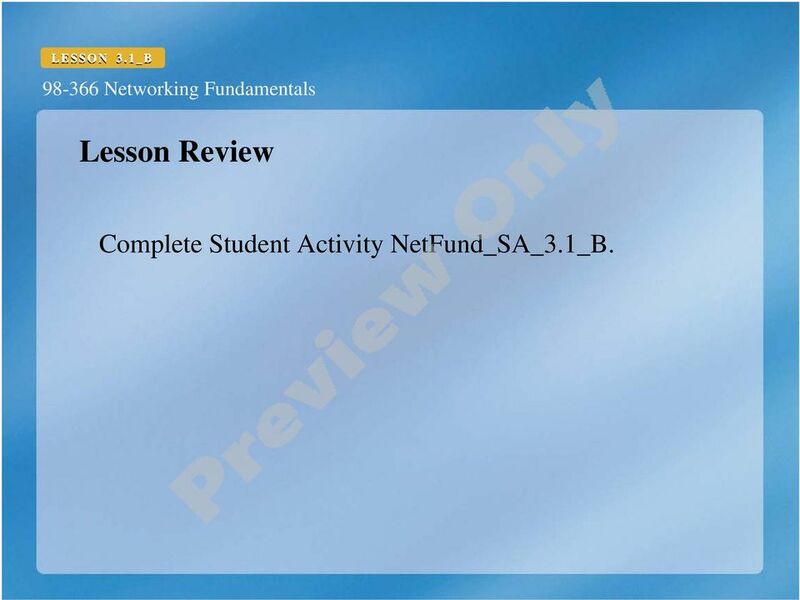 16 Lesson Review Complete Student Activity NetFund_SA_3.1_B. 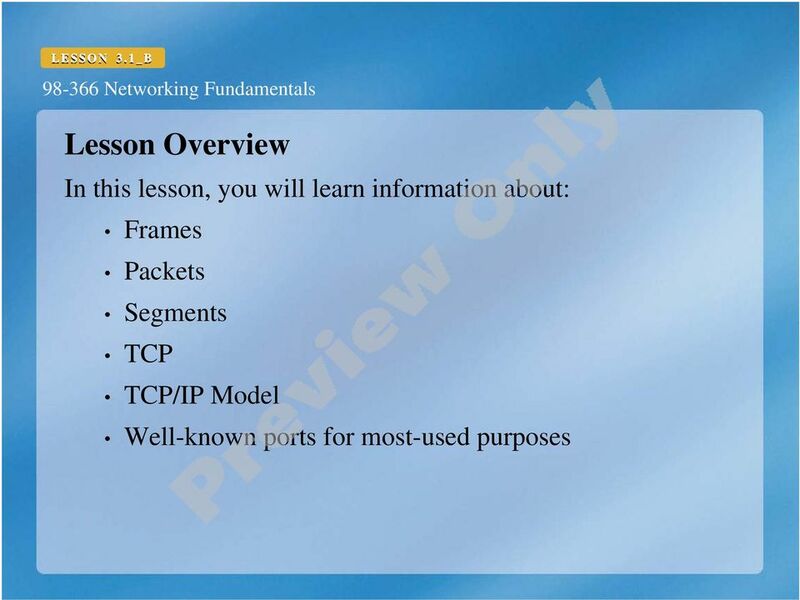 Introduction CSC 5991 Cyber Security Practice Lab 1: Packet Sniffing and Wireshark The first part of the lab introduces packet sniffer, Wireshark. Wireshark is a free opensource network protocol analyzer. 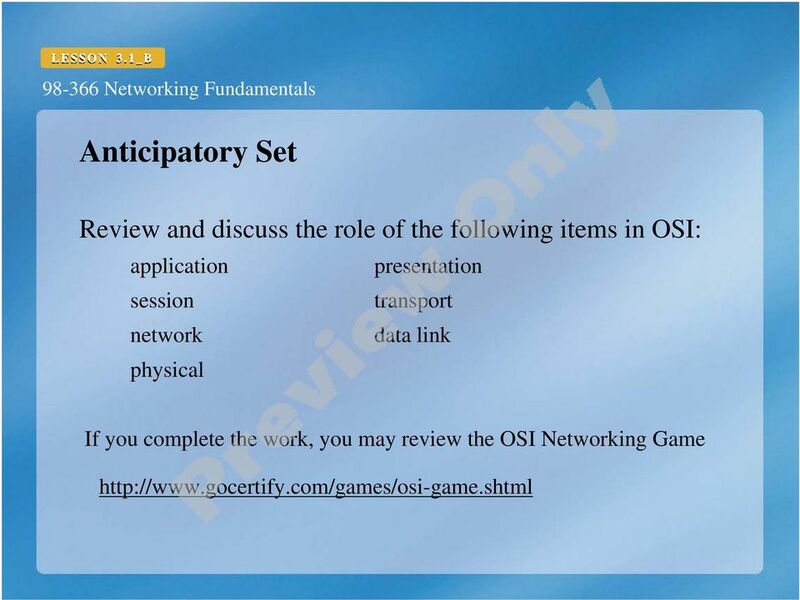 CHAPTER 1 Protocols and Layers 25 a truck or plane. It sounds like a very complicated way to deliver one message, but this system makes the overall task of delivering many messages easier, not harder.